Rhamaceae - buckthorn family Dicot. 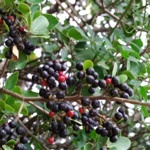 The Mediterranean buckthorn, Rhamnus alternus, has dark green, glossy, evergreen leaves and in summer has clusters of bright shiny berries which change from green to red and then black. The flowers are visually inconspicuous greenish yellow, but very fragrant. The berries are not considered as human food but provide nutrition for birds. The plants have been domesticated and are considered by gardeners to form handsome hedges.It originates around the Mediterranean and has naturalised in areas with a similar climate, where it can become invasive, on Skopelos it occurs in the macchie, where it is often entangled with other plants. + alternus describing alternate arrangement of leaves.